Are you considering an Innkeeping career? As an Aspiring Innkeeper, whether for a few days for a few years, you have many questions - and we have many answers! Financing a start-up B&B, purchasing an operating inn, insurance, business basics, cost-effective marketing, property management systems ... PAII's online resource center and weekly communications to members address these "need to know" topics. How to attract Millennials / Gen Xers, are online reviews influencial, how imporant is social media, how does Google determine placement ... this is just a small sample of topics that are delivered to your email inbox weekly. 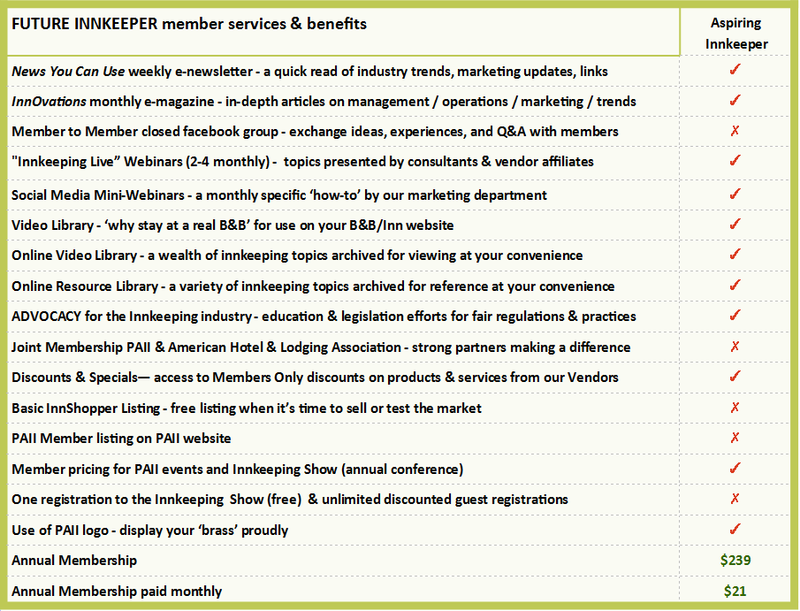 Two to four times a month, webinars address essential innkeeping topics. Future innkeepers - and current innkeepers - have busy schedules, so PAII's publications and webinars are recorded and archived for research and review anytime. And, there's just no substitute for learning directly from innkeepers and industry consultants & experts at PAII's annual Aspiring Innkeeper Seminar - it's a full 2-day event. Immediately following is the 3-day Innkeeping Conference & Trade Show - we recommend continuing your education in the business of innkeeping with sessions designed for basic to advanced knowledge levels. You'll meet your future partners at the Trade Show and in education sessions: the businesses that supply the products, services, and knowledge for operating your inn, along with innkeepers who share their experiences and insights.